In 1994, the Bishops of Ohio formed the Ohio Catholic School Accrediting Association (OCSAA). The OCSAA is a collaborative undertaking of the Catholic dioceses in Ohio and is governed by the Superintendents of Schools who serve as the OCSAA Commission. The purpose of the OCSAA is to strengthen Catholic school identity and mission, and engage Catholic schools in the ongoing improvement of student learning. In keeping with the mission of the OCSAA, the OCSAA process has as its hallmark a commitment to continuous improvement. As a member of the OCSAA, Ursuline High School engages in strategic planning to ensure a high-performing school in which students are grounded in their faith life and achieve at high levels. OCSAA accreditation also requires Ursuline High School to show evidence that they are implementing OCSAA Standards. The State Board of Education has approved these Standards as comparable to the ODE’s Operating Standards for Ohio’s Schools. Through the OCSAA accreditation process, Ursuline High School maintains its state charter. 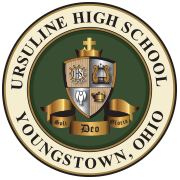 Ursuline High School is fully accredited by the OCSAA and possesses a charter from the State of Ohio to operate. AdvancED, formerly known as the North Central Association of Colleges and Schools, is the largest community of education professionals in the world. AdvancED is a non-profit, non-partisan organization that conducts rigorous, on-site external reviews of PreK-12 schools and school systems to ensure that all learners realize their full potential. Their expertise is grounded in more than a hundred years of work in school accreditation. Ursuline High School is fully accredited by the AdvancED Accreditation Commission, the national commission that confers the North Central Association Commission on Accreditation and School Improvement (NCA CASI) accreditation seal. This means that Ursuline High School is recognized across the nation as a quality school. To learn more about the School Accreditation Process, visit www.advanc-ed.org.